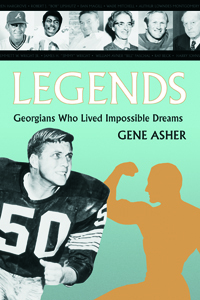 What you do not know about Georgia’s greatest athletes and some of its leading citizens you will learn in Gene Asher’s Legends. Anthony Joseph 'Zippy' Morocco won a football scholarship to the University of Georgia, but he won All-American honors in basketball. Phil 'Knucksie' Niekro failed to get a contract when he tried out for the Pittsburgh Pirates. The Milwaukee Braves did sign him but kept him on the bench or in the minors for six years. So what happened to Niekro, the knuckle-ball pitcher? As an Atlanta Brave, he was selected to the major league All-Star game five times, won five Golden Glove awards and earned membership in baseball’s hall of fame. Bill and Jeanne Daprano of Fayetteville have won more than 100 pieces of Gold in Masters Track Championships, more than any other husband-wife team in the history of US track and field. The late Bill Paschal of Atlanta, a Georgia Tech dropout, played one season on the 'B' team before joining the New York Giants and twice leading the National Football League in ground-gaining. At age eight-nine, Juvenile Court Judge Aaron Cohn of Columbus is the longest-serving juvenile court judge in America and a champion tennis player. These and formerly untold stories of Georgia Bulldog immortal Charley Trippi, eighty-six-year-old Furman Bisher, who continues to be one of the most prolific sports columnists in America, and Lee Burge, the man who went from the mailroom to the boardroom of Equifax are among many other sports and civic greats included in Gene Asher’s Legends.